55BC-1087: Julius Caesar to William the Conqueror From Britannia under the Romans to the Dark Ages and the invasions of Angles, Saxons, Danes, and Norwegians. 1087-1327: The Making of the Nation The Crusades, Welsh and Scottish rebellions and the foundations of the modern state – including Magna Carta and the fledgling English Parliament. 1327-1547 The Black Prince to Henry VIII The Hundred Years’ War, the Peasants’ Revolt, the Wars of the Roses and the reign of Henry VIII. 1547-1660 Elizabeth I to Cromwell Elizabeth I’s long reign; the Civil War, the execution of Charles I and the establishment of Cromwell as Lord Protector. 1660-1702 Restoration and Glorious Revolution The return of Charles II, the Great Plague and Great Fire of London, and a ruler from a different country on the throne: William of Orange. 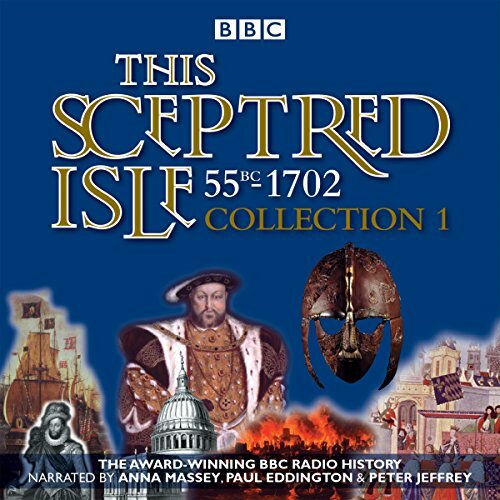 Narrated by Anna Massey, with extracts from Sir Winston Churchill’s A History of the English-speaking Peoples read by Paul Eddington and Peter Jeffrey, this is the definitive radio account of the events and personalities that have shaped our nation. CD 1 includes a special PDF file featuring the original booklets from each volume. Christopher Lee is a British writer, historian and broadcaster, best known for writing the radio documentary series This Sceptred Isle for the BBC. His study of the British monarchy and its future was published in spring 2014 and his book on Royal Ceremony and Regalia is to be published early 2015. He is also the writer of more than 100 Radio 4 plays and series.